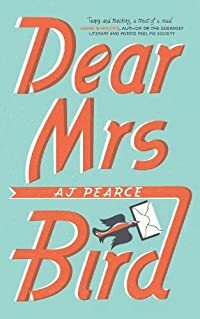 Dear Mrs Bird by A.J. Pearce which has just been published has been recommended by various Goodreads friends and bloggers recently and given the World War 2 London in 1941 setting it seemed it would be right up my street – and it was. Emmeline Lake has always fancied being a newspaper reporter, really she would love to be a war correspondent eventually. When she sees an advert for a job at a newspaper she thinks it’s a job made for her. She’s so excited about the prospect of becoming a journalist that she doesn’t pay much attention at the interview. She’s successful in getting the job but on her first day there she realises she has been an idiot as the job is actually for a typist, an office junior, and it’s not even at a newspaper. She’s working for Woman’s Friend which is a very old-fashioned publication, but even worse than that it seems to be ruled over by Mrs Bird who is an absolute harridan, a bully and a complete prude. There’s a problems page with readers writing in to find solutions to the situations they’ve found themselves in, but Mrs Bird will have nothing to do with any UNPLEASANTNESS and Emmy’s time is mainly taken up with cutting up problem letters that Mrs Bird doesn’t even want to see never mind answer. Emmy feels that she should try to help these desperate women and gets herself into trouble over it. Meanwhile her fiance Edmund is causing problems for her, and as the Luftwaffe cause mayhem in London Emmy and her friends at the Auxiliary Fire Service Station that she volunteers at part-time are having a tough time. But this book is certainly not all doom and gloom in fact it has plenty of humour. World War 2 is just about my favourite setting and I read a lot of books that were written then, so I was a wee bit worried that this one might not have the correct wartime atmosphere but it is mainly successful although the author mentions the sound of machine guns during a bombing raid. There’s no mention of the ack-ack guns which would have been booming out constantly trying to shoot down the Luftwaffe, machine guns would be useless under those circumstances. Page 196 has some repetition with a paragraph being repeated with the second one having a bit more added on at the end and elsewhere there’s a spelling mistake – just mentioning!